During his address on the Ram temple at Delhi University last week, BJP leader Subramanian Swamy said that former Prime Minister Rajiv Gandhi had personally assured him of help for the movement. Swamy said that despite Congress opposition, Gandhi had allowed the airing of the television show Ramayana, which created excitement among the people about the issue. 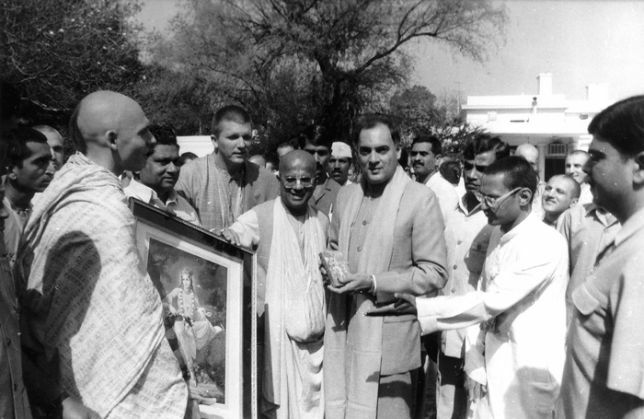 Recalling Rajiv Gandhi's supposed commitment to the cause, Swamy urged Congress not to oppose the construction of the temple for political reasons. While it cannot be ascertained if Rajiv Gandhi was as enthusiastic about the Ram temple as Swamy makes him out to be, a look at history indicates that the former prime minister played a huge role in the Ram Mandir movement and the 6 December 1992 demolition of the Babri Masjid. Organisations like the Vishwa Hindu Parishad, the Bajrang Dal, the RSS and the BJP have been continuously accused of exploiting the rather sensitive issue for their political or personal gains. It is alleged that the BJP made its presence felt on the national pedestal for the first time after the Ram Janmabhoomi agitation kicked off. However, many often ignore, or are unaware of the agenda of the Congress government led by Rajiv Gandhi which actually gave a push to the entire fiasco. When the Babri Masjid-Ram Janambhoomi dispute first flared up in 1949, the state authorities thought it best to lock the disputed premises so that neither Hindus nor Muslims could use the disputed place for the purpose of worship and lay claim to it. The main aim of the Sangh Parivar's anti-Babri Masjid campaign from 1984 onward was to get the mosque unlocked so that they could appropriate the space as a site of worship for Lord Ram, says a report by the Hindu, which quotes the Liberhan Commission report. Having succumbed to the demands of Muslim hardliners in the Shah Bano case, with his decision being labelled as an attempt at Muslim appeasement, Rajiv Gandhi saw in the Mandir movement an opportunity to display 'soft Hindutva'. In 1986, he ordered the opening of the gates of the disputed structure, allowing the entry of Hindus to worship, thus paving the way for VHP to mobilise supporters to construct Ram Mandir. The issue soon became a matter of national importance and the situation was dexterously exploited by right wing groups like VHP and BJP. In addition, a Babri Action Committee was also formed by the Muslims to put forward their claims and demands. The Ram Janmabhoomi movement started by VHP in 1984 brought together thousands of Kar Sevaks who marched towards Ayodhya in 1992. The violence that ensued will always be remembered as one of Independent India's most shameful moments.